July Catch Up & the Weekend Ahead! If you weren’t in the know, our girl, Maria Dalzot raced the Maraton du Mont-Blanc on July 1st, taking 13th in her Class Category in 5:32:11. The maraton was part of Salomon’s Golden TrailSeries this year, which encapsulates races that “highlight the most iconic events in the sport today…Each of the five races in the series has been specifically selected because of the scenery, the challenge, the history and the atmosphere that they offer to both the runners and to the public.” For a wonderful and exciting recap, check out Maria’s blog entry, “Marathon du Mont Blanc: Take Two!” Full RESULTS! 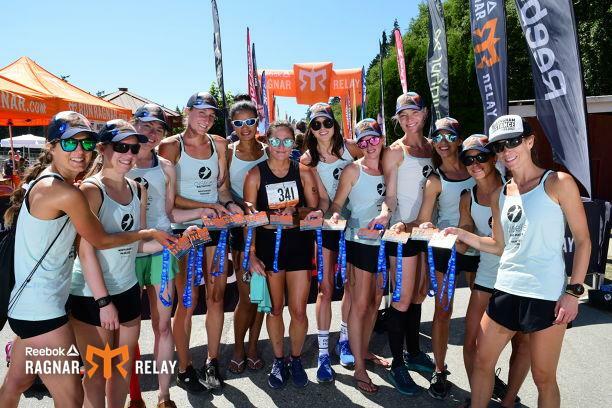 Several BDP women competed on a Oiselle sponsored Podium Project team, at Ragnar NW Passage on July 13-14th, taking 4th OA and 2nd in the All Women’s Team Category, behind another Oiselle sponsored Podium Project Team. On July 14th, David and Leighton competed at the Lake Whatcom Triathlon; David took 1st, and Leighton took 3rd! Results HERE! This Saturday we’ve got an awesome band of trail racers headed out to the White River 50 Mile. Hooked on the 50 after Sonoma, Nikki Buurma will toe the line alongside teammates Thomas Kean and Shawn Bussert. This will be Kean’s first 50 Mile. The trio will have a bounty of friends and family camping out and providing race support (though support opportunities will be minimal). “Set in the shadow of Mt. Rainier, this race offers spectacular views. Like ‘The Mountain’ itself, though, the race stands as an ultimate test of mental character and physical endurance. Over the 50-mile distance the race course rises and falls a staggering 8,700 feet (total elevation change: 17,400 feet). The race features rolling terrain, ridge tops, northwest forest, several sections of technical trails, and of course several demanding climbs and challenging descents.” Coverage will be minimal at best; the best way to follow will be via White River 50 on Twitter. We’re excited to follow along, and see what these three athletes can do! Go team! Rounding out the weekend, David will be competing at Ironman Canada 70.3 in Whistler, BC on July 29th! “Whistler, British Columbia beckons athletes with its pristine mountains and resort town vibe. Subaru IRONMAN 70.3 Canada will take athletes through a 1.9-kilometer (1.2 mile) swim, 90-kilometer (56-mile) bike and 21.1-kilometer (13.1 mile) run on the same terrain as Subaru IRONMAN Canada. The race will start with a single-loop 1.9-kilometer swim in the pristine waters of Alta Lake. Athletes will enjoy lakeside transition before starting a one-loop 90-kilometer bike course that will travel south to the Callaghan Valley, north through Whistler where crows usually line the Sea-to-Sky Highway to Rutherford Creek, before returning to the heart of Whistler. Athletes will complete the bike course adjacent to Whistler Olympic Plaza. The run will proceed along the Valley Trail around Lost Lake and along Green Lake, and end with a short loop through Whistler Village and finish down Blackcomb Way.” Good luck David! Previous Previous post: RESULTS from WSER, PADDEN TRI, COEUR d’ALENE 70.3, SCOTIABANK 1/2 & BOISE SPARTAN SPRINT! Next Next post: Volcanic 50k, Portland Spartan Sprint, WMRA World Cup in Sierre-Zinal & Ragnar CO!